We usually think of dandelions as a persistent weed. To a certain extent, this is true, but in the early spring when the greens are young, it can be delicious. Here it’s featured in “salade au larde”, otherwise known as one of the regional dishes of the Ardennes, a region of extensive forests in southeastern Belgium, Luxembourg and France. The fancy name shouldn’t scare you away. You can make it in less than 20 minutes and best of all, it’s even better the day after once the flavors have had a chance to meld. Steam or boil potatoes in their skin until tender, but not falling apart. Transfer with a slotted spoon to a bowl, peel if you wish and dice. Render bacon until crisp. Whisk together the vinegar, olive oil, sugar, salt and pepper. 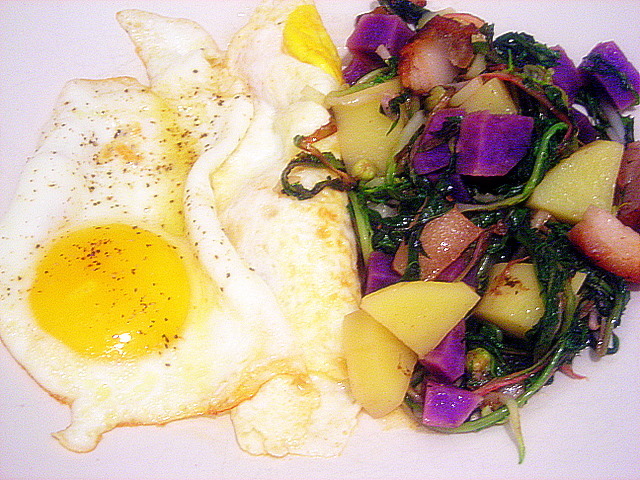 Combine potatoes, bacon and dandelion greens. Pour dressing over all and toss to combine. Serve immediately. (2) Arugula or watercress are good substitutes. 03 May	This entry was published on May 3, 2009 at 4:58 pm. It’s filed under food, French food, general and tagged breakfast, dandelions, eggs. Bookmark the permalink. Follow any comments here with the RSS feed for this post. I’ll have to try this salad recipe. I like non lettuce salads. I usually substitute spinach, kale or cabbage for it most times. Never tried dandelion greens before. Absolutely love dandelion greens so I’m happy to see a dish that includes them. 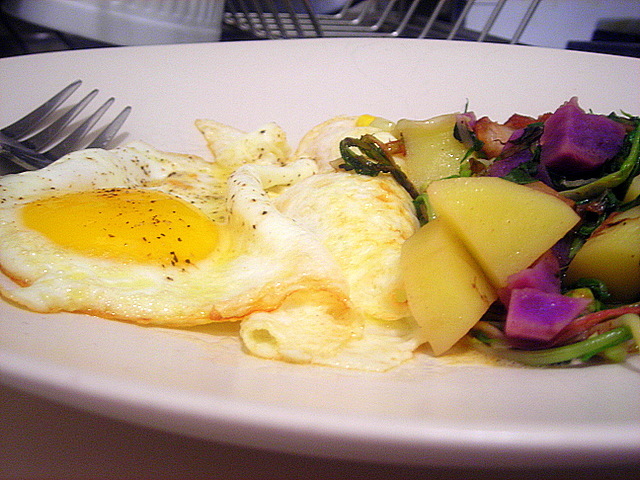 The Purple Peruvians really makes this dish visually appealing. Delana — dandelions have a slight undertone of bitterness to them, sort of like endive or chicory. this is easily alleviated once they’re exposed to heat and/or a dressing with some acid, like lemon juice or vinegar. I bought dandelion greens last week from USGM and have been searching for a way to use them besides simply sauteing them. This sounds perfect.